I know when I plant them, that one day they may have to be sacrificed to the Great Deity of Planting Distances. I water them, feed them and nurture them, in the full knowledge, that in the future, they will be dug out and slung, unceremoniously, on the compost heap. overcrowded border in need of a good cull ! When I began to garden, all those years ago, I adhered strictly to planting distances, and lived with acres of bare soil, until the plants filled out. This could take years, if shrubs were involved. Now, I have always disliked bare soil, as my mother used to say 'nature abhors a vacuum', so what does nature do ? Why, encourage weeds to colonise the bareness, that's what ! Taxi for the Daylily and the Ligularia ! My inexperienced self was discussing this with a gardening friend, and bemoaning the vast tracts of brown, around my tiny plants, and she gave me the benefit of her wisdom. Her advice was 'cram them in' ! She probably phrased it better than that, but that was the essence of it. A difficult call ... the fern and the Penstemon in front of it ? She said she planted things close together initially, to give an instant effect, and to cut down on the weeding. When things began to grow, and fill out, and the plants were becoming crowded, she dug them up and moved them elsewhere. Brilliance ! Simple yet so effective ! What's needed here ? 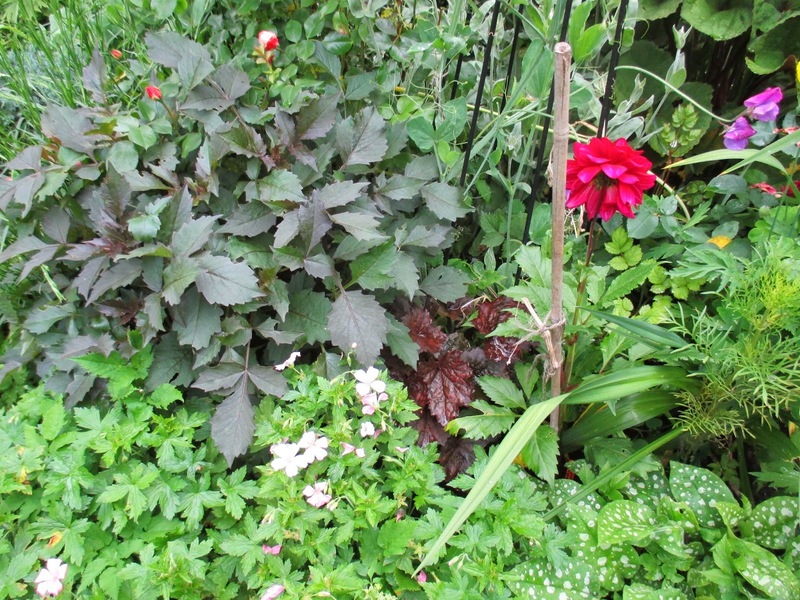 drastic cut back of the geranium and the Heuchera outed, perhaps ? No contest - get your coat poppy! To be honest, I couldn't think of anywhere to move my excess plants too, as after thirty plus years, all beds have been dug. It was an odd sensation to realise that my usual method would no longer work. About this time every year I have to do a sweep of the garden, and define every plant, making sure that it has its own space to grow in. I plant very densely anyway, so have to monitor growth closely. This is a very personal thing, as one woman's well spaced plants, are another woman's overcrowded ones. I am always interested to see how other gardener's manage spacings, and the results differ greatly. Some people prefer a circle of bare soil, or visible mulch, around each plant, whereas others have the plants tumbling over each other, in a dense tapestry. All the photos in this post are the 'before' shots ! 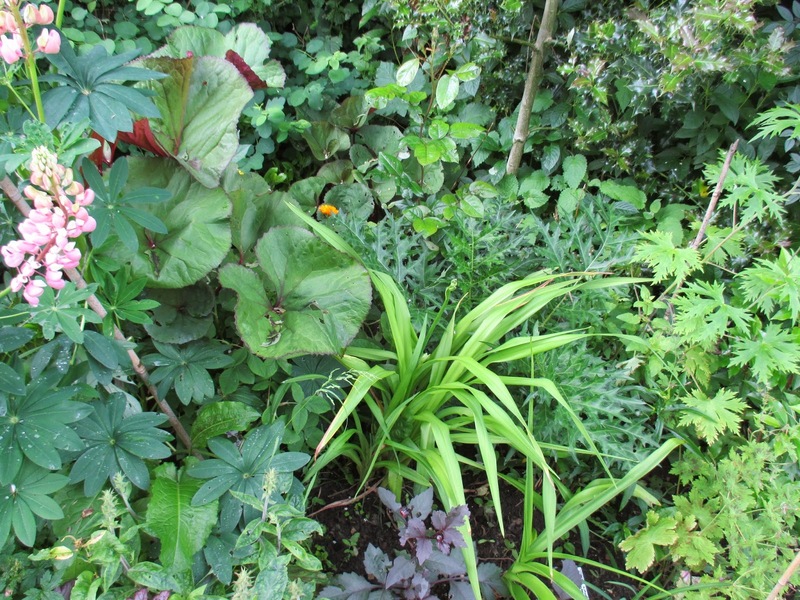 They all show the evidence of my over planting , and my next job is to go round and gently dig up the plants which are suffering through overcrowding and find them a new home. A poor Ligularia desperate for a new home where it can spread its wings ! 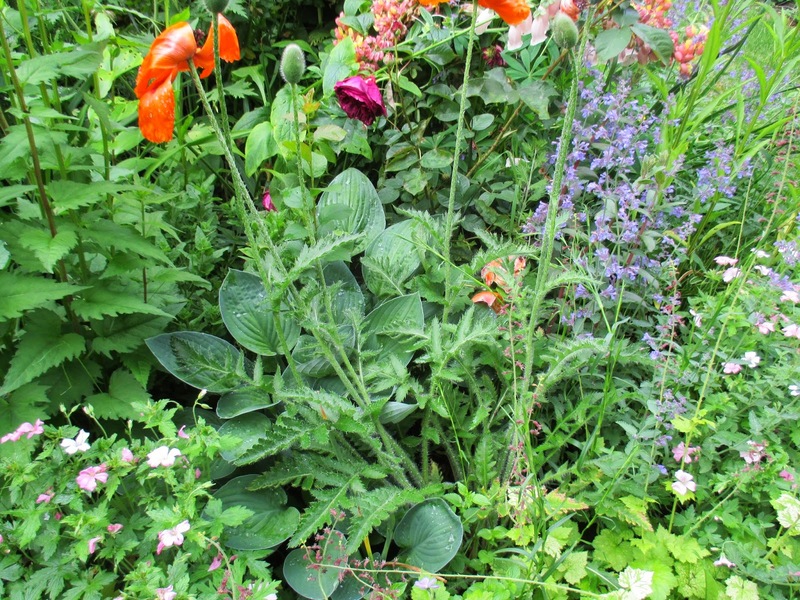 My own tapestry is extremely dense by this point in the year, so there are quite a few plants which will have to be carefully dug out and rehomed - some in the compost (erm, the brick red perennial poppy) and others potted up and given to friends. There is a young peony in there begging for release ! While I was walking round, deciding on my sacrificial lambs, a cunning plan started to form... 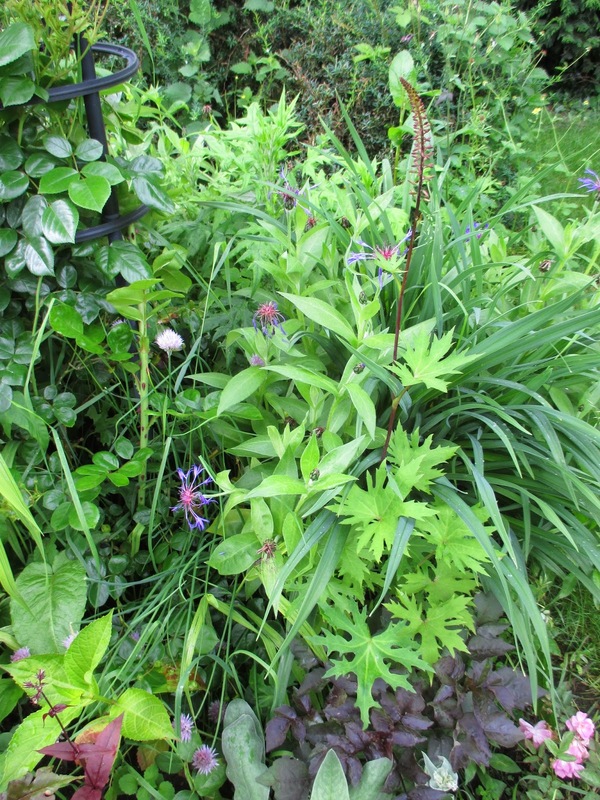 I spotted a border which could do with being cleared out, extended and replanted. Yippee ! A double whammy ! A home for those crowded out plants, and an opportunity for more colour. The part of the border needed fettling, too much thuggish lamium, too many self seeded aquilegias and not enough structure. I had thought of it as a difficult border as it is shady, but it was only shady because the silver birch had low branches, which could be removed. I lifted the canopy of the birch, allowing much more sunlight in, and all my sacrificial lambs escaped the compost heap ! Nature's way of telling me to get digging! And now I have the dreaded bare earth again! It's funny how nearly all gardeners find the answers and solutions to their gardening dilemmas themselves just by looking around, brewing ideas, and thinking thoroughly about it. 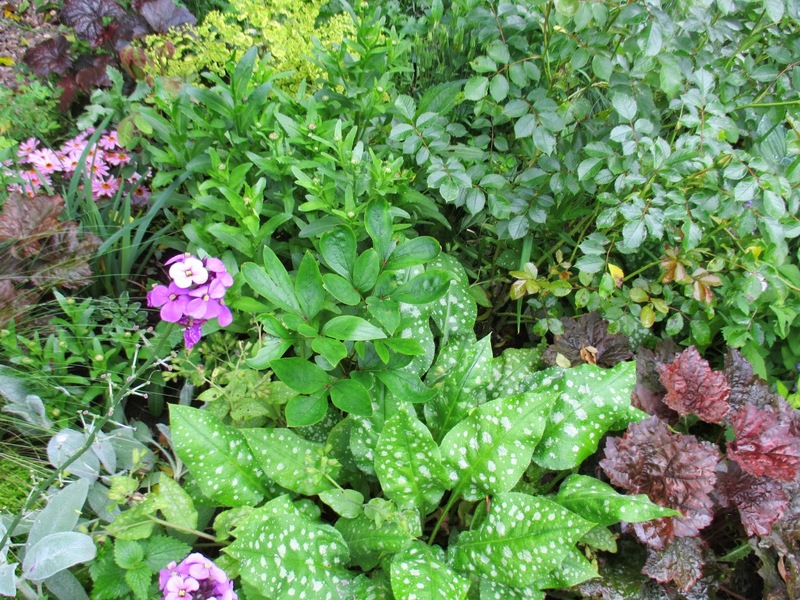 As we are plant collectors and have a jungle style garden plants are crammed in to get that lush jungle look. It's not a long term home either so there's much less emphasis on the permanency of plants so the present and immediate future is more of a priority when trying to achieve the look. Hi Mark & Gaz, it is such an individual thing, and varies widely. I love the lush jungle feel, where plants are densely planted. I also hate bare earth with a passion! 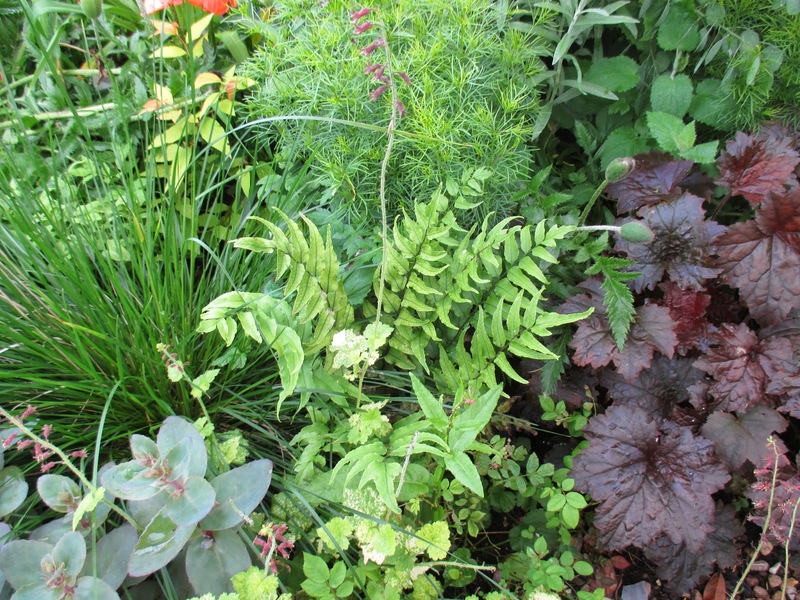 Hi Stephanie, it really is hard to decide, and I find it one of the most difficult bits of gardening, but I think that is because I walk a tight line between 'densely planted' and 'overcrowded'! It is often a tough call. 30 + years of gardening (more like 40 when I count up properly!) and still learning every single day ! I hate to see bare earth too and suffer the same problems as you - I often put new plants in containers till they have established themselves but then it is hard to find a space big enough to plant them in. May be if I just lifted and split the plants it wouldn't cost me so much in trying to fill the borders. 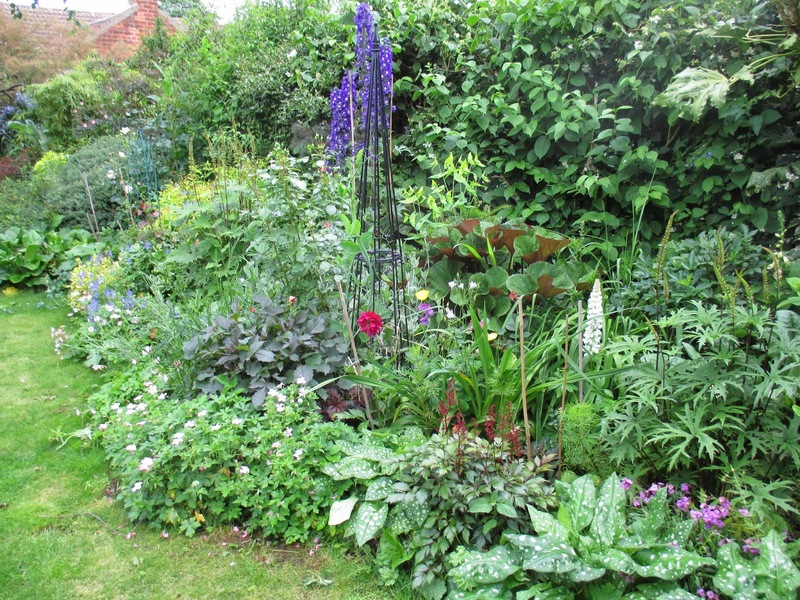 You have such a variety of plants and your borders are looking lovely - a tapestry indeed. Hi Elaine, lifting and splitting is fine, but it doesn't work with all plants, and besides, what is nicer than a trip to a nursery where you emerge with a car full of new plants ! Good idea to keep them in containers until they have filled out a bit! Oh, Jane you did a hard work digging and planting. I always plant very closely and then I see that I have to remove some plants in another spot. That's a problem for me because I have no much space as you had during 30 years. And I then realize that I have to give them to neighbors or they go to compost as well. Hi Jane, I must prefer a well packed garden because I love yours! It must be hard to pull yourself away to do anything else this time of year. Thanks for your pearls of wisdom! There are lots of spots in my garden that can use filling in. I'm going to be bold! Hi Flower Freak,you are too kind ! It's all a matter of personal taste, I think, I suppose that is one of the joys of gardening, that you only have to please yourself, and the rules are your rules !! Well stocked borders always look so much better than those with lots of soil. 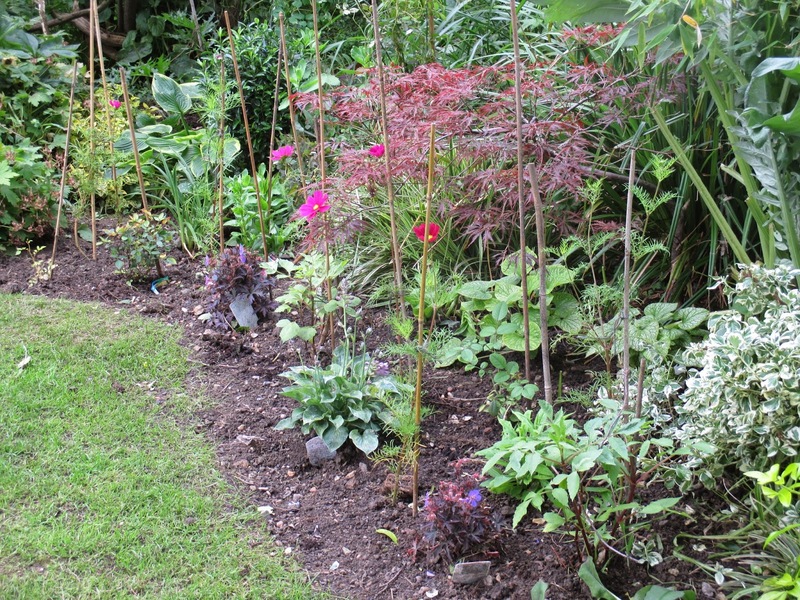 When planning a border, after it has been planted up with correct spacings, I usually sprinkle annual seeds between the plants while waiting for the plants to grow. Even so, I feel that after about 10 years, most borders need an overhaul to bring them to life again, an opportunity to buy new plants! Annual seeds are a cracking idea Pauline ! 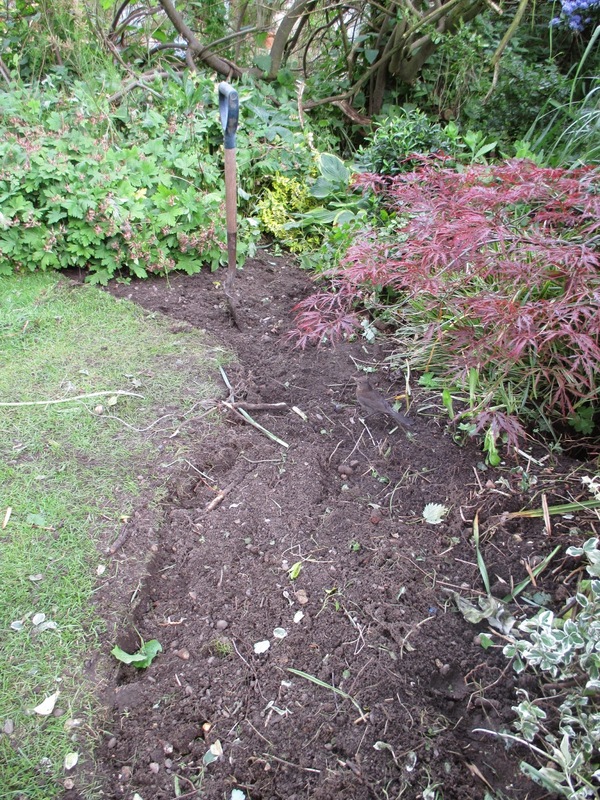 I agree that all beds and borders need a good 'bottoming' after a few years ! I'm a crammer and mingler too. 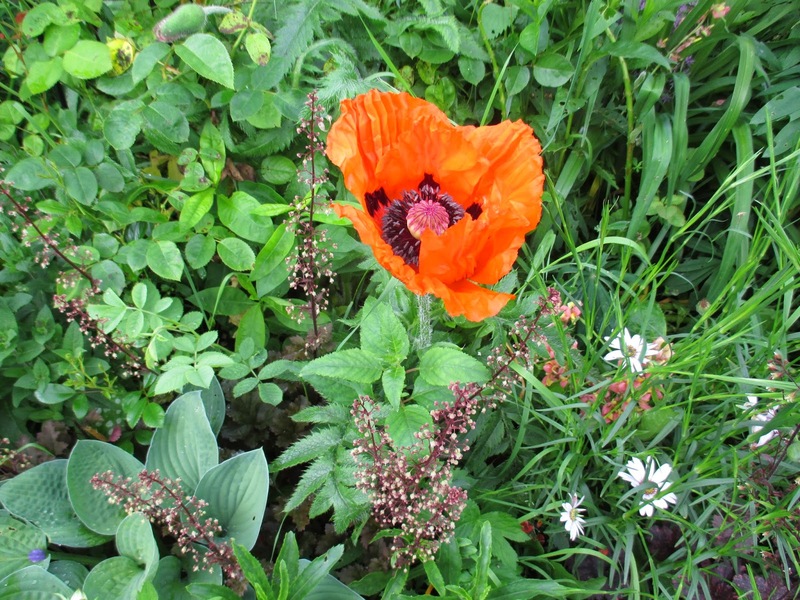 Many plants that hae outgrown their welcome end up planted on the plot! Hi Sue - crammers and minglers unite ! We now have a voice and a title ! A timely post for me Jane. I am working away on my flower garden and realizing one of my mistakes these past couple years is I have always left lots of room for plants to grow into. Even with plenty of mulch I end up with more weeds than I can cope with. I'm going to heed your advice and off to the nursery with me! Ooh Marguerite, don't be too hasty , the books don't advise it, and it is a very personal thing ! I have to rehome a lot of my poor plants after a couple of years ! I like this approach, Jane! I always tried to be so meticulous about spacing - only to find the plants grew to different dimensions than expected anyway! So all this sounds quite good to me! Hi Amy, I know what you mean ! I get really cross when the ones at the front grow bigger than the ones behind them ! Especially when they are not supposed to ! For 2 years running the Rodgersia has been massive, due to the rain, and dwarfed the fern behind it ! For the previous 4 years, it was the other way round! Hi Tammy, I bet mildew is a real problem, and you must need that free flow of air around each plant to keep it healthy. Ours here in the uk need to huddle together for warmth !! Your garden is very much like mine, plants shoehorned in wherever they will fit. I have always understood the essence of "cottage gardening" to be that you allow your plants to do what they will and allow self-seedlings to develop where they appear, this in turn is controlled in my case by ripping out pieces of those which have overshot their boundary to relieve the situation. If this sounds cruel I can longer lift them to replant as I have nowhere left to replant and any gardening friends have already absorbed too much surplus. End result, chaos, but its my chaos. Ah, that all sounds very right and familiar ! That is my understanding of cottage gardening too. It is a riot but a controlled riot. 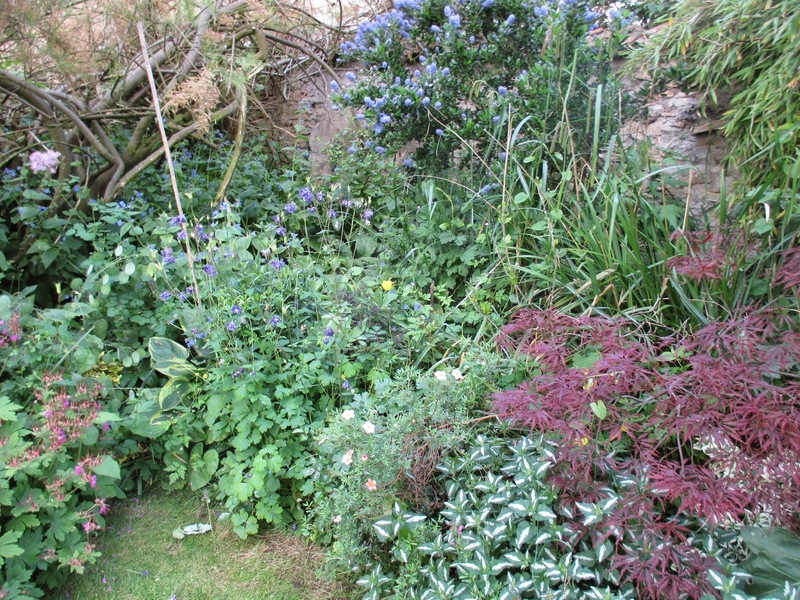 I love that feel of the garden being full and verdant, that lush growth all around. Not for us the circles of bare earth around each plant ! We have a very similar approach to gardening. My garden is densely planted as well. Like you I did up and move the plants to new spots as they get too crowded. I am not yet at the stage where I am out of room, but that day is coming! I thought I liked to plant densely, but you definitely put me to shame in the category. Congratulations on your new garden bed. Personally I cannot bear tossing out a plant, and unfortunately I simply don't know enough people to give homes to my spreading irises or rudbeckia. Hi sarah, I have to say that the beds look better now I have done my 'culling' - the photos are the 'before' photos, I should really post the 'after' photos too ! I am the queen of cramming! Jane thanks for this lovely blogpost with great advice. I mulch the bare bits. Plant far too much too close. Add even more with cuttings harvested from pruning. Working my way along the path to the front door. Steadily pushing back the thugs (Plumbago tangling its fingers in my hair) - and rediscovering my original planting plan! Ah, how I ash I could describe Plumbago as a 'thug'! I have tries several times to grow it inside, but it has sickened and died each time !